Following more than two decades of Arctic sea ice thinning and melting, an unusual event just weeks before the start of the spring melt season is providing visual proof of how vulnerable the ice pack really is. 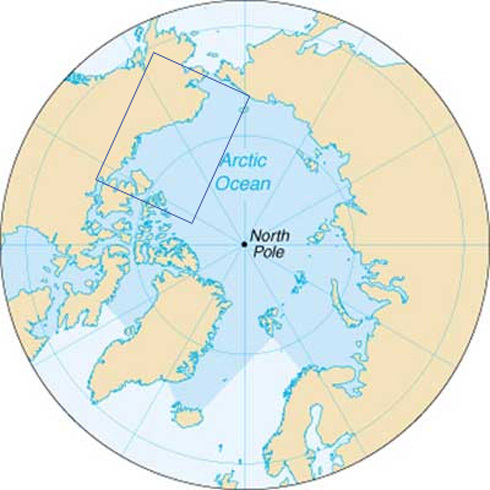 During the end of February and continuing into early March, large fractures in the sea ice were observed off the north coast of Alaska and Canada, from near Ellesmere Island in the Canadian Arctic to Barrow, Ala., the northernmost city in the U.S. The rapid climate change in the Arctic and sharp decline of sea ice has been attributed to manmade global warming, along with natural climate variability, and projections show the region becoming seasonally sea ice free by midcentury. According to the National Snow and Ice Data Center (NSIDC) in Boulder, Colo., this fracturing event appears to be related to a storm that passed over the North Pole on Feb. 8, 2013, creating strong off-shore ice motion. The event is unusual but not unheard of, as similar patterns were seen in early 2011 and 2008. However, the NSIDC said the fracturing this time is more extensive. The spread of the ice fractures can be seen in a video animation from satellite imagery, provided by the NSIDC. The NSIDC said the fracturing is likely a sign of the prevalence of young and thin sea ice, which can be disturbed more easily by weather patterns and ocean currents, and also melts more easily when exposed to warm air and ocean temperatures during the melt season. As Arctic sea ice extent has plummeted since 1979, down to a record low in September 2012, first-year ice has become much more common across the Arctic, as thick, multiyear ice has declined. “The large area of fractured ice is located in predominantly first-year ice, which is thinner and easier to fracture than thick, multiyear ice,” the NSIDC said on its website. For instance last year at the start of February I wrote about the spectacular lack of ice in the Kara and Barentsz Seas, notably around Novaya Zemlya. I had a hunch that this was pretty much unprecedented during the satellite era and said as much in a guest post for Climate Progress. I was mildly criticized for it by the NSIDC’s Walt Meier via Climate Central (and I will never forgive him for it 😉 ). Now the hunch turned out to be reasonably correct – although there had been a similar retreat of ice at a later date in 2011, caused by wind patterns – but I didn’t invest the time to make sure it was. This year things are calm in the Kara and Barentsz Seas. At the surface that is, with not even a breeze towards the coast to show how strong or weak the ice is. But as usual, when it’s calm on one side of the Arctic, something is going on on the other side. Some commenters have been keeping a sharp eye on this, and I think it now merits a blog post of its own, if only because of the possible implications this event might have for the ice pack once the melting season gets underway. And it’s big time spectacular. Last week, on February 22nd commenter A-Team – who has really been animating the blog lately, figuratively and literally speaking – made the animation you see on top of the post, showing massive cracking in the Beaufort Sea. In the following days fellow commenter Jim Hunt picked up on that and wrote a blog post on his Econnexus blog called Arctic Sea Ice is Cracking Under the Strain with a spectacular image of the ice pack in the Beaufort Sea on February 27th. To recapitulate: It is normal for the ice to crack and for leads to occur. However, this is very extensive cracking and there are some very big leads, and all of it seems to come earlier than expected. Given last year’s melting mayhem and the low amount of multi-year ice, it makes one wonder whether this early cracking will have any effect in the melting season to come. There are still several weeks to go before this part of the Arctic is going to start melting, up till then the ice will actually thicken some more, even when the Sun’s rays start to reach the ice. But the ice is already getting broken up in smaller pieces, which means that 1) the pack becomes more mobile (like we saw last year), and 2) the thin ice that now grows to fill up the leads, will go first when the melting starts, potentially leading to more open water between floes to absorb solar energy and convert it to heat. But maybe not. Maybe this will have zero influence. We don’t know. That’s why we watch. Thanks for including a link to my own version of the early days of these events in your article. If you try clicking the link in that article to the US Navy’s latest ice thickness forecast you will see that even more excitement is predicted for we Arctic sea ice watchers. But it’s in The Daily Mail man!!! It has to be true. Who is it that’s conning who here? I was quite surprised that the more rational comments had such huge positive votes considering who usually reads the Mail. Hope they finally post your comment.Good luck! Yikes indeed – as someone else has said – my thoughts exactly. Scary stuff and scary timing.